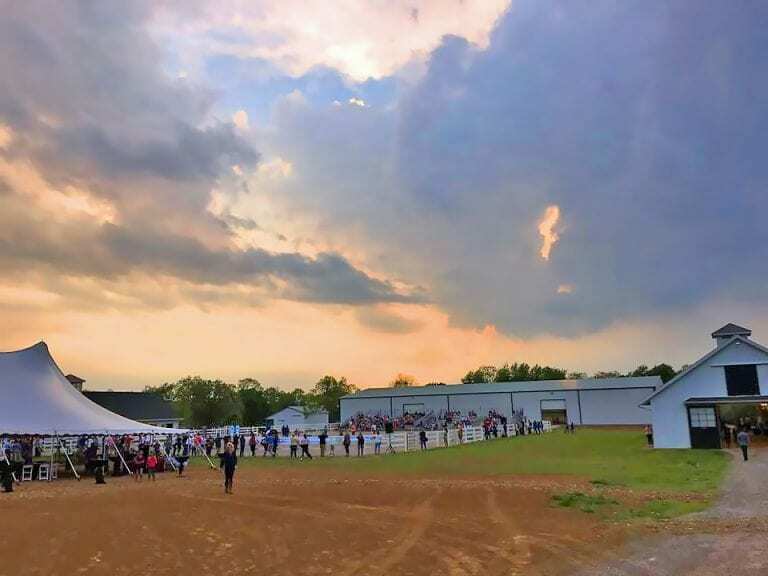 Over 600 people from the racing and sport horse industries braved threatening skies to attend the New Vocations Open Barn and BBQ on April 28th, sponsored by AmWager and Siena Farm. Intended to celebrate the heart and versatility of the Thoroughbred breed, the event was a tremendous success, raising much-needed awareness of the importance of Thoroughbred aftercare while spotlighting New Vocations' mission to rehab, retrain and rehome retired racehorses. “It was really inspiring to see so many people involved in the equine industry, from owners and trainers of Thoroughbreds to equestrians and horse enthusiasts, come to visit our new facility. The main thing every person had in common was a mutual respect and love for the Thoroughbred. We are blessed to be able to open our facility to the public and ultimately help shed more light on how much good is being done for the aftercare of racehorses,” shared Anna Ford, New Vocations Program Director. New Vocations at Mereworth Farm welcomed guests to tour the nearly complete, state-of-the-art retraining and adoption facility. The biggest draw was the retired racehorses that filled the 30 stalls, each of which was either up for adoption or in training to be put up for adoption. The barns stayed packed throughout the night as guests visited with the horses, read race records and learned about each horse's background. The evening also consisted of several demonstrations, including acclaimed international event rider Dorothy Crowell and her OTTB Tom Swan, now shown as ThisisGonnaBeFun. The two jumped around an impressive course of jumps, showing off the natural athleticism of the Thoroughbred. Dorothy chatted with emcee Jen Roytz, aftercare advocate and writer, about her history with and love for the Thoroughbred breed. Next up in the stellar speaker lineup was Valerie Ashker, who shared with the crowd her adventures of riding cross-country aboard her beloved OTTB Primitivo. An avid proponent of what Thoroughbreds can do once they retire from the track, Valerie made her six-month journey in an effort to raise social awareness of the strength, stamina, courage and versatility each retired racehorse possesses even after their racing career is over. Both Valerie and Dorothy then critiqued four horses in-hand: three New Vocations horses that will be available for adoption and Dorothy's demonstration mount ThisisGonnaBeFun. The crowd gained valuable insight into what each rider looked for in a mount, as well as got a sneak peek at some horses that will soon be up for adoption. The final presenter of the night was Lindsey Partridge, 2015/2016 Trail Champion and 2016 Freestyle Champion at the Retired Racehorse Project's Thoroughbred Makeover. Lindsey wowed the crowd amid gusty winds aboard her 2017 Makeover partner Bowdrie, who clearly demonstrated the bond he shared with his rider. Lindsey spoke to the crowd about her training methods and then introduced her second Makeover horse, Comandante, whom she adopted from New Vocations. The event had an up-beat vibe that continued well past the final demonstration as many people stayed and visited the horses, and enjoyed the live music and open bar sponsored by Buffalo Trace, Jackson Family Wines and Tito's Handmade Vodka. To learn more about New Vocations aftercare efforts please visit newvocations.org. This entry was posted in Horse Care and tagged Mereworth Farm, New Vocations, New Vocations Racehorse Adoption, OTTB, racehorse rehabilitation, racehorse retirement, racehorse retraining, retired racehorse, retired racehorses by Edited Press Release. Bookmark the permalink.